R.S. 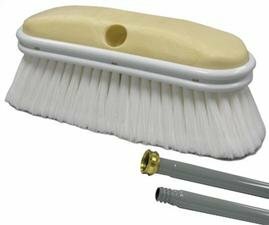 Hughes Company offers a huge selection of facilities maintenance products including this vehicle wash brush. Comes with the following: (12) x Handle, (12) x Head. Dimensions are particularly important when considering purchasing a vehicle wash brush. The dimensions for this SKU include: 9 1/2 in head length, 2 1/2 in trim length and a 2 3/4 in head width. The bristle color for these products come in various colors. This item has white bristles. While brushes can generally be used in various applications, this particular brush performs primarily as a vehicle washing brush. The material used in this SKU are: foam block and polystyrene bristle.